Serap Slorach is a single working mum of one. A couple of years ago, she launched a business, Yummy Things, with her friend and fellow mum, Emer. Together they produce and sell fresh, tasty handmade jams and chutneys. Serap explains how her business got started, and how she makes it work with being a single mum. What did you do before you had your daughter? I worked for a promotional marketing agency in London, looking after the European accounts for brands like Coca Cola, McDonald’s and American Airlines. After I met my husband, I moved to Lincolnshire and worked with him on his business – Toni & Guy salon franchises. I took care of the business and marketing side of things, and worked on reception in the salons. We used to travel up and down between the salons in Newcastle and Hull, constantly on the go. How did things change after your daughter came along? We never really discussed whether I would return to work full time or not after we had Polly – we just stumbled along. When she was a baby, my husband stayed home two days a week so I could work, and then I’d look after her while he did. Over time I stopped working in the salons and just worked from home. When Polly was one, we moved to Newcastle because I hardly ever saw my husband. We put Polly in nursery three mornings a week so I could work, and the rest of the time I’d do things with her. I’d also write emails and take care of admin when she slept. When did the idea for your own business start? I’ve always loved cooking and baking. At Christmas I used to make jams and chutneys to give as gifts, and put together homemade hampers. Our house in Lincolnshire was great for entertaining and I loved cooking for people – one year I did the entire Delia Smith Christmas book! So I started thinking about what I could and wanted to do. I thought my dream job would be to have a little bakery or pop up tea shop and sell homemade cakes, jams and chutneys. But I didn’t want to do it alone. I wanted to share the experience, and started wondering who I could do it with. Straight away Emer, my business partner, came to mind – I remembered having a dinner party conversation with her months before about our mutual love of food and baking. Thankfully, Emer was as enthusiastic as me, and we decided to give it a go. Our first fair was St Oswald’s big Christmas event in Newcastle. We sold about 250 jars which we were delighted about. Then we discovered they had no refreshments or food at their monthly car boot sales, so started doing pop up tea shops there too. I remember in the beginning, placing our first order for jam jars. It was for 48 jars and we ummed and ahed about it for days, wondering if it was too much. Now our usual order is for 800! Over time we realised that the pop up tea shops were too weather dependant – one time our gazebo blew away, and we were rained on so many times as we tried to set up or pack up! And while we loved baking and the social aspect of the tea shops, we realised that we needed to focus on one thing – tea shops or jams and chutneys. It just wasn’t realistic to try and do both. In the end, we decided to concentrate on making and selling jams and chutneys as they have a longer shelf life than cakes, so we don’t need to worry if we don’t sell all our stock at an event. I love the alchemy of creating them – and that people originally made them to prolong the life of summer fruits, and now they’ve become such a key element of our day to day eating. We love them on breads and in cakes, with cheeses and cold meats. They can be used to make salad dressings, on pizza dough… they’re so versatile. I love creating a little pot of something that has such an exciting taste. How have things changed as your business has grown? To start with, we made our own handwritten labels. Then we progressed to printing them at home. Then, last Christmas we made enough money at the fair to hire a designer to do our branding and logo – and design professional labels. Once we had an identity, we set up Twitter and our website. Twitter is a great way to engage with other businesses. Within an hour of writing my first tweet, a local deli we admire sent us a message saying they liked the look of our jams, and asked for our wholesale prices! We also do a lot of regional food fairs, and through them have connected with a farm that now supplies us with their glut of strawberries. Another farm shop owner said he was looking for local jams and chutneys to sell, and asked to stock our products. It feels lovely to be part of a growing local community. How important is having your own business to you? About two months after I first had the idea of the business, my marriage broke up and I became a single mum. I feel like my business is my second baby and it has really helped me get through a difficult time in my life. If I ever feel stressed, I make some jam or chutney and it calms me! I adore the precision of the process – measuring the right ingredients out and watching the timings. But I also love how sometimes you can use the same ingredients and measurements, but get different results because of the type of apples you use. How does your business fit into your life? When my marriage first ended, I got a job at a restaurant making cakes. I loved my job – making huge vats of chocolate brownies that people paid to eat and enjoy. But in the end, it just didn’t work with being a single mum. If I had cakes still baking I’d have to call a friend and ask them to pick Polly up. I felt that I really needed to put Polly first and find something that worked with her. So I decided this was a great time to explore the possibility of starting my own business and really make it happen. Now things work well – I can manage the business around my commitments and still have time for myself. Most days I take Polly to school, then come back and put some chutney on. Then I’ll write some emails and invoices, check the chutney and put a wash on. 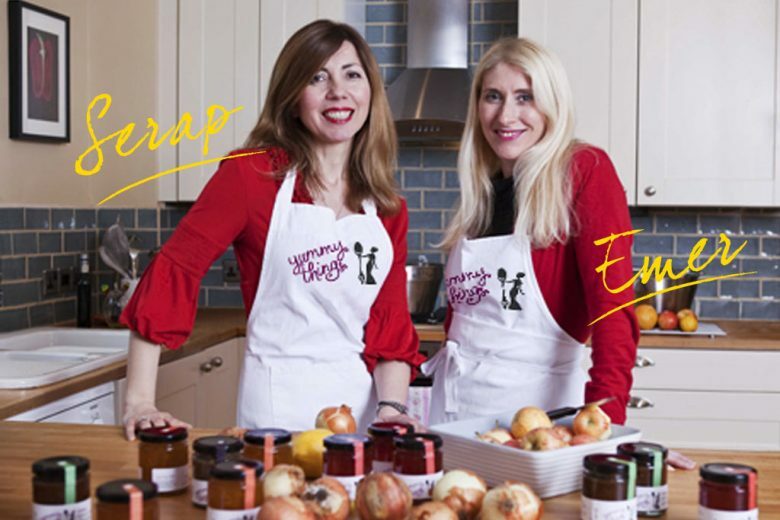 Emer and I also both often stay up late cooking after the kids have gone to bed – especially if we have fridges full of fruit that needs to be used before it goes bad. I also love the fact that the work can be so varied throughout the year. We are passionate about using fresh, seasonal produce, which means that summer is focussed on making use of all the ingredients that are in abundance then, cooking and bottling up. Some marmalades and chutneys can be made year round, so I try to spread them over the months. In winter I look at the financials and long term strategy. In fact, the only downside to the business is that both Emer and I have boxes of jam jars filling up our houses and garage! How does your relationship with Emer work? It’s really well balanced! I’m quite impulsive and Emer’s more measured. I want to make decisions quickly, but she insists we sleep on them, which is always the more sensible thing to do. She’s great at handling a lot of the details like registering with local authorities, getting our kitchens approved, finding out what labelling information we need, and collecting data and implementing it. I’m more concerned with financial matters. She’s also good at building relationships – she was the one who first connected with the farm and farm shop. Yummy Things is a hobby that has become a business and we are keen to grow organically because we have other commitments. It also doesn’t yet support us financially, so needs to fit around our kids and the other things we do. The long term goal is to make my business my main job and source of income, so it can give me the financial independence I am lacking right now – and to carry on loving it as much as I do! Want to find out more about Serap and Emer’s business? Check out their website, and follow their updates on Twitter.